Ṭāhir ibn Ḥusayn, also known as Dhul-Yamīnayn, and al-Aʿwar, was an Iranian general and governor during the Abbasid caliphate. Specifically, he served under al-Ma'mun during the Fourth Fitna and led the armies that would defeat al-Amin, making al-Ma'mun the caliph. He was then rewarded as governor of Khorasan, which marked the beginning of the Tahirid dynasty. The Fourth Fitna or Great Abbasid Civil War resulted from the conflict between the brothers al-Amin and al-Ma'mun over the succession to the throne of the Abbasid Caliphate. Their father, Caliph Harun al-Rashid, had named al-Amin as the first successor, but had also named al-Ma'mun as the second, with Khurasan granted to him as an appanage. Later a third son, al-Qasim, had been designated as third successor. After Harun died in 809, al-Amin succeeded him in Baghdad. Encouraged by the Baghdad court, al-Amin began trying to subvert the autonomous status of Khurasan, and al-Qasim was quickly sidelined. In response, al-Ma'mun sought the support of the provincial élites of Khurasan and made moves to assert his own autonomy. As the rift between the two brothers and their respective camps widened, al-Amin declared his own son Musa as his heir and assembled a large army. In 811, al-Amin's troops marched against Khurasan, but al-Ma'mun's general Tahir ibn Husayn defeated them in the Battle of Rayy, and then invaded Iraq and besieged Baghdad itself. The city fell after a year, al-Amin was executed, and al-Ma'mun became Caliph. Muhammad ibn Harun al-Rashid, better known by his regnal name of al-Amin, was the sixth Abbasid Caliph. He succeeded his father, Harun al-Rashid in 809 and ruled until he was deposed and killed in 813, during the civil war with his brother, al-Ma'mun. Sīstān, known in ancient times as Sakastan, is a historical and geographical region in present-day eastern Iran and southern Afghanistan. 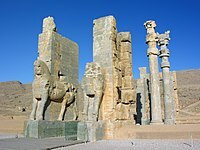 The Saffarid dynasty was a Muslim Persianate dynasty from Sistan that ruled over parts of eastern Iran, with its capital at Zaranj. Khorasan, Afghanistan and Sistan from 861 to 1003. The dynasty, of Persian origin, was founded by Ya'qub bin Laith as-Saffar, born in 840 in a small town called Karnin (Qarnin), which was located east of Zaranj and west of Bost, in what is now Afghanistan - a native of Sistan and a local ayyar, who worked as a coppersmith (ṣaffār) before becoming a warlord. He seized control of the Sistan region and began conquering most of Iran and Afghanistan, as well as parts of Pakistan, Tajikistan and Uzbekistan. Shurṭa is the common Arabic term for police, although its precise meaning is that of a "picked" or elite force. Bodies termed shurṭa were established in the early days of the Caliphate, perhaps as early as the caliphate of Uthman (644–656). In the Umayyad and Abbasid Caliphates, the shurṭa had considerable power, and its head, the ṣāḥib al-shurṭa, was an important official, whether at the provincial level or in the central government. The duties of the shurṭa varied with time and place: it was primarily a police and internal security force and also had judicial functions, but it could also be entrusted with suppressing brigandage, enforcing the ḥisbah, customs and tax duties, rubbish collection, acting as a bodyguard for governors, etc. From the 10th century, the importance of the shurṭa declined, along with the power of the central government: the army—now dominated by foreign military castes —assumed the internal security role, while the cities regained a measure of self-government and appropriated the more local tasks of the shurṭa such as that of the night watch. Abu al-Husayn Ishaq ibn Ibrahim was a ninth-century official in the service of the Abbasid Caliphate. A member of the Mus'abid family, he was related to the Tahirid governors of Khurasan, and was himself a prominent enforcer of caliphal policy during the reigns of al-Ma'mun, al-Mu'tasim, al-Wathiq, and al-Mutawakkil. In 822 he was appointed as chief of security (shurtah) of Baghdad, and over the next three decades he oversaw many of the major developments in that city, including the implementation of the mihnah or inquisition, the removal of the Abbasid central government to Samarra, and the suppression of the attempted rebellion of Ahmad ibn Nasr al-Khuza'i. After his death, the shurtah of Baghdad briefly remained in the hands of his sons, before being transferred to the Tahirid Muhammad ibn 'Abdallah ibn Tahir in 851. The Mihna refers to the period of religious persecution instituted by the 'Abbasid Caliph al-Ma'mun in 833 AD in which religious scholars were punished, imprisoned, or even killed unless they conformed to Muʿtazila doctrine. The policy lasted for fifteen years as it continued through the reigns of al-Ma'mun's immediate successors, al-Mu'tasim and al-Wathiq, and two years of al-Mutawakkil who reversed it in 848 AD. The term "Anarchy at Samarra" refers to the period 861–870 in the history of the Abbasid Caliphate, which was marked by extreme internal instability and the violent succession of four caliphs, who became puppets in the hands of powerful rival military groups. The term derives from the then capital and seat of the caliphal court, Samarra. The "anarchy" began in 861, with the murder of Caliph al-Mutawakkil by his Turkish guards. His successor, al-Muntasir, ruled for six months before his death, possibly poisoned by the Turkish military chiefs. He was succeeded by al-Musta'in. Divisions within the Turkish military leadership enabled Musta'in to flee to Baghdad in 865 with the support of some Turkish chiefs and the Tahirids, but the rest of the Turkish army chose a new caliph in the person of al-Mu'tazz and besieged Baghdad, forcing the city's capitulation in 866. Musta'in was exiled and executed. Mu'tazz was able and energetic, and tried to control the military chiefs and exclude the military from civil administration. His policies were resisted, and in July 869 he too was deposed and killed. His successor, al-Muhtadi, also tried to reaffirm the Caliph's authority, but he too was killed in June 870. With Muhtadi's death and the ascension of al-Mu'tamid, the Turkish faction around Musa ibn Bugha, closely associated with Mu'tamid's brother and regent al-Muwaffaq, became dominant in the caliphal court, ending the "anarchy". Although the Abbasid Caliphate was able to stage a modest recovery in the following decades, the troubles of the "Anarchy at Samarra" inflicted great and lasting damage on the structures and prestige of the Abbasid central government, encouraging and facilitating secessionist and rebellious tendencies in the Caliphate's provinces. Al-Mustaʿin was the Abbasid Caliph from 862 to 866, during the "Anarchy at Samarra". After the death of previous Caliph, al-Muntasir, the Turkish military leaders held a council to select his successor. They were not willing to have al-Mu'tazz or his brothers; so they elected Ahmad ibn Muhammad أحمد بن محمد, a grandson of al-Mu'tasim, who took the regnal name al-Mustaʿin bi-llah. Abū ʿAbd Allāh Muḥammad ibn Jaʿfar, better known by his regnal title al-Muʿtazz bi-ʾllāh was the Abbasid caliph from 866 to 869, during a period of extreme internal instability within the Abbasid Caliphate, known as the "Anarchy at Samarra". Abu’l-ʿAbbās Aḥmad ibn Jaʿfar, better known by his regnal name al-Muʿtamid ʿAlā ’llāh, was the Abbasid Caliph in Baghdad from 870 to 892. His reign marks the end of the "Anarchy at Samarra" and the start of the Abbasid restoration, but he was a largely a ruler in name only. Power was held by his brother al-Muwaffaq, who held the loyalty of the military. Al-Mu'tamid's authority was circumscribed further after a failed attempt to flee to the domains controlled by Ahmad ibn Tulun in late 882, and he was placed under house arrest by his brother. In 881, when al-Muwaffaq died, loyalists attempted to restore power to the Caliph, but were quickly overcome by al-Muwaffaq's son al-Mu'tadid, who assumed his father's powers. When al-Mu'tamid died in 892, al-Mu'tadid succeeded him as caliph. Abdallah ibn Tahir was the Tahirid governor of Khurasan from 828 until his death. He is perhaps the most famous of the Tahirids. The Battle of Dayr al-‘Aqul was fought on April 8, 876, between forces of the Saffarid amir Ya'qub ibn Laith and the Abbasid Caliphate. Taking place some 80 km southeast (downstream) of Baghdad, the battle ended in a decisive victory for the Abbasids, forcing Ya‘qub to halt his advance into Iraq. Abu Ahmad Talha ibn Ja'far, better known by his laqab as al-Muwaffaq bi-Allah, was an Abbasid prince and military leader, who acted as the de facto regent of the Abbasid Caliphate for most of the reign of his brother, Caliph al-Mu'tamid. His stabilization of the internal political scene after the decade-long "Anarchy at Samarra", his successful defence of Iraq against the Saffarids and the suppression of the Zanj Rebellion restored a measure of the Caliphate's former power and began a period of recovery, which culminated in the reign of al-Muwaffaq's own son, the Caliph al-Mu'tadid. Abu'l-Abbas Muhammad ibn Abdallah ibn Tahir was a Tahirid who served the Abbasid Caliphate as governor and chief of police of Baghdad from 851 until his death, during a particularly troubled period in the city's history, which included its siege during the civil war of 865–866, in which he played a major role. He also served in the 860s as governor of Iraq, Mecca and Medina, and was noted as a scholar, a poet and a patron of artists and scholars. Shah ibn Mikal or al-Shah ibn Mikal, was an Iranian nobleman from the Mikalid family, who served as a military commander of the Tahirid dynasty and Abbasid Caliphate. Muhammad ibn Ishaq ibn Ibrahim was a Mus'abid governor of Baghdad for the Abbasid Caliphate, from 850 until his death. Abu Abdallah Muhammad ibn Ibrahim ibn Mus'ab was a Mus'abid military commander and provincial official for the Abbasid Caliphate. He served as the governor of Fars from 846–7 until his death. Al-Husayn ibn Isma'il ibn Ibrahim ibn Mus'ab was a ninth century army commander in the service of the Abbasid Caliphate. He was particularly active during the period known as the Anarchy at Samarra (861–870). The shākiriyya were a regular cavalry regiment of the Abbasid Caliphate in the "Samarra period" in the 9th century. Probably of Khurasani and Iranian origin, they were rivals of the Turkish guard, and played a major role in the court conflicts that marked the decade of the "Anarchy at Samarra" in the 860s. ↑ Encyclopedia Britannica "Ṭāhirid dynasty, (821–873 ce), Islamic dynasty of the land of Khorāsān (centred in northeastern Persia), which owed nominal allegiance to the ʿAbbāsid caliph at Baghdad but enjoyed virtual independence." ↑ Introduction: the Turko-Persian tradition, Robert L. Canfield, Turko-Persia in Historical Perspective, ed. Robert Leroy Canfield, (Cambridge University Press, 1991), 6. 1 2 The Tahirids and Saffarids, C.E. Bosworth, The Cambridge History of Iran, Vol. 4, ed. Richard Nelson Frye, (Cambridge University Press, 1999), 90-91. ↑ Encyclopedia Iranica "The Taherids of Iraq. As the events of the late Taherid period demonstrate, the Taherids in Iraq were just about as powerful and important, even if less well known, than their Khorasani relatives. They regularly held positions as military commanders, heads of the security forces (ṣāheb al-šorṭa) for eastern and western Baghdad, and chief tax collectors or administrators (e.g., ʿāmel and moʿāwen) for the Sawād of Kufa." ↑ Ann, Porter, Venetia (1992). "The history and monuments of the Tahirid dynasty of the Yemen 858-923/1454-1517". etheses.dur.ac.uk. Retrieved 2018-12-02. 1 2 Hugh Kennedy (14 December 2015). The Prophet and the Age of the Caliphates: The Islamic Near East from the Sixth to the Eleventh Century. Routledge. p. 139. ISBN 978-1-317-37639-2. ↑ John L. Esposito (6 April 2000). The Oxford History of Islam. Oxford University Press. p. 38. ISBN 978-0-19-988041-6. 1 2 3 Tahirids, C.E. Bosworth, The Encyclopaedia of Islam, Vol. X, ed. P. J. Bearman, T. Bianquis, C. E. Bosworth, E. van Donzel and W. P. Heinrichs, (Brill, 2000), 104-105. 1 2 3 4 Bosworth, Clifford Edmund (1996), The New Islamic Dynasties, (New York: Columbia University Press, 1996), 168-9. ↑ Turner, John P., "Ishaq ibn Ibrahim," in Medieval Islamic Civilization, Volume 1, Ed. Josef W. Meri (Routledge 2006), p. 402. ↑ Bosworth, C. E. (1969). "The Ṭāhirids and Persian Literature". IRAN, the journal of the British Institute of Persian Studies. 7: 103–106. doi:10.2307/4299615.